A wonderful soup, combining sweet and tart together. Quite heavenly. Melt butter in a large pan over medium-high heat. Add the squash which should be peeled, seeded and chopped into 1/2" cubes, chopped white and green part of the leeks, chopped carrots and chopped celery. Sauté, stirring, 10-12 minutes. Add 2 of chopped the apples, (the other whole apple you will use later), thyme and sage. Add broth and 1 cup cider. Bring to simmer; cover. On low, cook until vegetables and apples are tender, stirring, 30 minutes. Remove from heat; cool. Boil remaining 1/2 cup cider in a small pan until reduced to 1/4 cup, 5 minutes. Cool. Place sour cream in a small bowl then whisk in reduced cider. Puree soup, in batches, in blender. Return to pot; season with salt if needed. Halve and core remaining apple; slice. Serve soup with cider cream. Garnish with bacon and apple. 216 members have added this recipe to their cookbook. How big is a serving? The recipe says it makes 6 servings, but I ended up with almost a gallon, way more than what 6 people could eat... Other than that, it tastes great. I'd skip the cider cream though, makes it a little too tart. 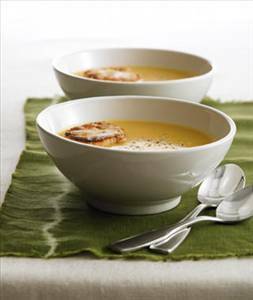 There are 304 calories in 1 serving of Butternut Squash and Apple Soup with Cider Cream. Calorie break-down: 44% fat, 46% carbs, 10% protein.